As Leeds headed to QPR for the re-arranged game, I tried to ignore all the stats coming out about their recent bad run of defeats. 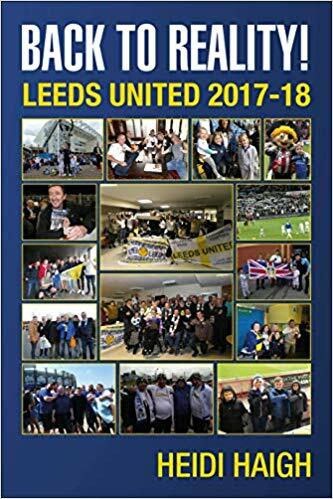 Having followed Leeds for so long, I know the form books go out of the window when they play us but for once I was hoping we would have the impetus. I would much rather play games on the said day and get the points rather than have a game in hand. Time would tell how that would pan out. I want to say a big thank you to my friend Sue for being a shoulder to cry on. The team: Casilla, Ayling, Cooper, Jansson, Bamford, Hernandez, Phillips, Alioski, Roberts, Klich and Harrison. Subs: Douglas for Phillips (65), Dallas for Ayling (73) and Brown for Alioski (81). Leeds lost the game 1-0. Attendance was 14,763 with 3,105 Leeds fans. Leeds came out on the attack but the final ball was wide. Their goalie made a great save to deny us a goal from Phillip’s header from another attack. The closest we came to scoring was when the ball went across the penalty area and when it looked like Bamford was going to score; unfortunately he missed connecting with it. I wasn’t sure if he’d taken his eyes off the ball or whether it was just too far in front of him, as it was hard to say at the time. The saying that you have to take your chances when they are there comes to mind. QPR had been time wasting from the off but were continuing to frustrate Leeds by always trying to get the ball back off us. Roberts kept winning the ball but then lost it or gave it away and there were a lot of show boating flicks from a few players, that didn’t come to anything as QPR won it back. Despite us not scoring, the Leeds fans in the stand had been fantastic with constant singing and putting on a great atmosphere. This always lifts the mood for me as I love the singing. Leeds continued to have a lot of possession but were constantly passing the ball back to Casilla. He made one great save to keep out QPR and another one when he put his head on the line so to speak. We do seem to be passing the ball back a lot at the moment though and should remember the best form of defence is attack. Liam Cooper went off with a head injury that needed stitching just before half time. You could see Leeds just wanted to contain QPR to ensure they didn’t score until he came back on the pitch just before the whistle blew. At half time I was talking to some fans who said it had been rubbish so far. I didn’t think it had been too bad as we’d been attacking, but got that familiar sinking feeling in my stomach. QPR took the lead in the first few minutes of the second half which came from us not keeping possession. Our passing hadn’t been crisp, were short, and QPR took advantage to fight for the ball putting our players under pressure. As we lost the ball in the far right hand corner from us, the ball flew across the penalty area and their man was behind our players to put the ball into the net from close range. I’d no idea where Casilla was at this stage and will need to see what happened. The mistake of losing the ball at the back had cost us dearly. QPR went on the attack and Casilla was forced into making a couple of good saves to keep them out. Alioski brought out a great save from their keeper as he crossed the ball from the left when it looked ready to dip under the bar. When Phillips was subbed I was mystified because there were plenty of other players I would have brought off before him. I had to hope that Bielsa knew what he was doing. Douglas had a fantastic chance to score only to blast the ball high into the stand. It should have been on target at least. Frustrations were creeping in amongst the support with the miss although the fans were still getting behind the team. We had another great chance to equalise but the ball wouldn’t go in after first Dallas, then Bamford had their goalie making the saves and living a charmed life. I felt if we could get one goal then we’d get another but the longer the game went on, I knew it wasn’t going to happen. Izzy Brown came on for his debut; many Leeds fans think he is going to make a difference to us. My first impressions of him weren’t great, because his first tackle could have had him seeing red as soon as he got on the pitch. I would have taken a draw but the loss saw Leeds stay in third place on goal difference. Scoring is an issue at the moment that’s for sure despite all the possession we are having. Knowing how demoralised I felt at the end of the game, I could empathise with Bielsa after seeing the photo of him on social media, slumped on his haunches. We have to “Keep Fighting” every game and still get as many points as possible as it is not over yet. Please don’t put us through the horrors of the play offs Leeds, we need to aspire to automatic promotion and it isn’t over until the fat lady sings so they say! Keep the faith Leeds fans, as always we will have our ups and downs as we keep Marching on Together! For those fans who had to endure the normalities of motorway closures on an away day which meant some of our northern contingent didn’t get home until 4am, I hope the players appreciate what our supporters do to follow their team. West Bromwich Albion at home is going to be another key game this week so see you there, LUFC – Marching on Together.